134 pages | 16 B/W Illus. Beyond Self-Care for Helping Professionals is an innovative guide to professional self-care focused not just on avoiding the consequences of failing to take care of oneself, but on optimal health and positive psychology. 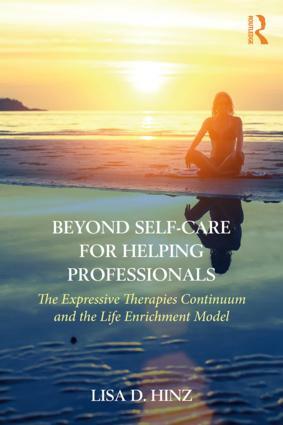 This new volume builds upon the Expressive Therapies Continuum to introduce the Life Enrichment Model, a strengths-based model that encourages mindful participation in a broad array of enriching experiences. By enabling therapists and other Helping Professionals to develop a rich emotional, intellectual, and creative foundation to their lives and clinical practices, this guide sets a new standard for self-care in the helping professions. "Dr. Hinz’s Life Enrichment Model extends self-replenishment for the helping professions to the enhancement and enrichment for individuals in their personal life. Through different aspects of physical activity, sensory exploration and involvement, acknowledgment of supportive patterns in everyday life, emotional expression, intellectual and spiritual enrichment, and appreciation of everyday creativity, it becomes a rich source to be revisited on its many levels." "I teach the Expressive Therapies Continuum to graduate students as the foundational framework for art therapy theory and practice. It’s exciting to see how Dr. Hinz has broadened the scope of the ETC in this fantastic new book! Her extension of the ETC to the Life Enrichment Model provides a unique avenue for achieving optimal health. This book will take its readers well beyond self-care as an indispensable source for helping professionals seeking to maintain vitality and well-being in their personal and professional lives!" "By building on the Expressive Therapies Continuum, Dr. Hinz turns her expertise from addressing clients to focusing on the needs of helping professionals. Having adapted art therapy to address professional burnout, I appreciate Dr. Hinz offering a clear model to encourage others to adopt these practices for themselves and when working with others. The field of art therapy has neglected the behavioral health practice of lifestyle management, but this book offers clear rationale and purposeful activities for incorporating this way of working. The activities are accessible for all regardless of artistic skill and experience. I look forward to recommending this book to colleagues, students, and clients." Lisa D. Hinz, PhD, ATR-BC, is an adjunct professor of art therapy at Notre Dame de Namur University and the author of many professional publications on art therapy.